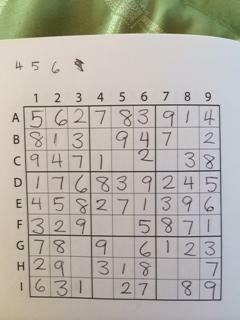 dailysudoku.com :: View topic - How do I solve this without doing trial and error? Posted: Tue Jan 14, 2014 12:29 am Post subject: How do I solve this without doing trial and error? Only 4s, 5s, and 6s are remaining. The only way I can think to solve this is to pick a cell that has two possible numbers; randomly pick one, and see if it works; if it doesn't work, go back and try the other one. I am a newbie; thanks for helping. I am not very good at solving puzzles without pencil marks, which is the term for writing in a blank cell all the possible numbers that could go in that cell and that's what I would do with this puzzle. However, there are people who are remarkably adept at solving without pencil marks. Maybe one of them will see your post. From the looks of the grid, it's possible that a BUG+1 will solve it and that's not a random guessing game, it's a legitimate technique. Thanks. Yes, I also mark the possible numbers in the remaining boxes. Every remaining box had at least two of the numbers 4,5,6. I tried reading what BUG+1 means, but I don't know how to use it to solve. A BUG (Bivalue Universal Grave) is when all unsolved cells have two candidates. This is also known as a Deadly Pattern because the numbers can be interchanged so there isn't a unique solution. A BUG+1 is all bivalue cells except for one that has more than two candidates, most of the time three candidates. You look at which number in the additional cell, if removed, would result in the Deadly Pattern. Since if removed a Deadly Pattern would form, that number is used to solve the cell. Another way to spot it is to use the number that appears three times in the box, row and column. Except for Box 9, each box has only two unsolved cells, so each cell has two possibilities. In Box 9, the possibilities are 4,5,6. H7 must be 5. Why? If H7 is not 5 it must be 46. Then, every cell has two possibilities. Pick one value in any cell, the other cells are solved. The puzzle has two solutions. The only way for the puzzle to have a unique solution is H7 = 5. Thank you so much for you reply. I understood everything you said, until you got to Skyscraper. What is a skyscraper? Posted: Sat Feb 15, 2014 4:04 pm Post subject: Aha! If you go to a site called sudokuslam it will explain how to solve this one. Enter the puzzle and then ask for a "Smart Hint". Hope this helps.